Are gophers destroying your landscape? It may be time to call the professionals at AmeriGuard Pest Defense today at 951-652-0505. Here is a picture of a successful underground trapping. Other than trapping, we also provide baiting and/or Gopher X tunnel smoker treatment. Call today. 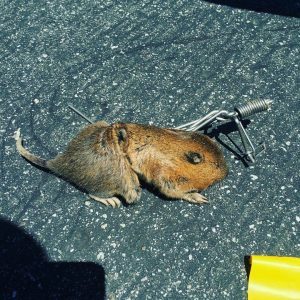 Note: Although some people may not like the idea of trapping and killing nuisance animals such as gophers, rats, mice, and squirrels, it is important to remember that that are a nuisance. Populations would continue to rise and further advance the damage they pose to residential and commercial properties and landscapes.